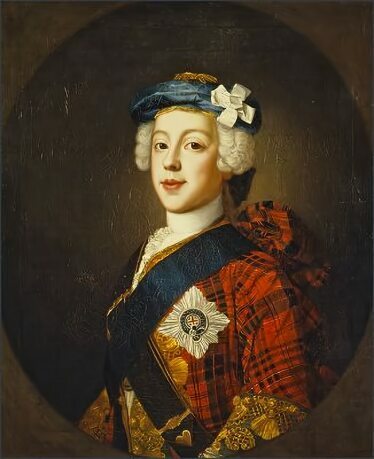 Although the Stuarts had lost the throne, the dynasty continued in the person of James II's son, James Francis Edward Stuart (1688-1766) and his sons, one of whom was Charles Edward Stuart popularly known as Bonnie Prince Charlie (1720-1788), who pressed their rights to the succession to the thrones of Britain. On a hereditary basis their claim was far superior to that of their Hanoverian cousins, but they were debarred from the throne by the Act of Succession, which forbade Catholics from succeeding. The supporters of the exiled James Francis Edward Stuart became known as Jacobites from the latin term Jacobus for James. Several attempts were made by them to regain the throne, most notably those of the 1715 and 1745 rebellions. They remained popular particularly in Scotland, the traditional homeland of the Stuarts. The Royal Stuart dynasty finally became extinct in the male line in 1807, on the death of the last legitimate grandson of James II, Henry Stuart, a Roman Catholic Cardinal, known as Cardinal York, at Frascati, Italy. The modern day heir to the Jacobite claim to the throne is Francis, Duke of Bavaria (b. 1931), who descends through Henrietta Anne, youngest daughter of Charles I.
Charles Edward Stuart or Bonnie Prince Charlie, as he was later to go down in history, was born at the Palazzo Muti in Rome on 31st December, 1720. 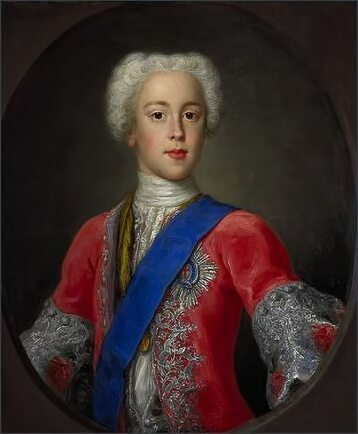 The son of James Francis Edward Stuart and the Polish Princess Clementina Sobieski, he was baptised Charles Edward Louis John Casimir Sylvester Severino Maria. Charles father, James, was the only surviving son of the Catholic King James II and VII, who died in exile in France, after his Protestant daughter, Mary II and her husband William III had taken the throne at the Glorious Revolution of 1688. The Stuart descendants of James II had remained in exile since then, a thorn in the side of the Hanoverian dynasty which had eventually supplanted them on the throne of Britain. Charles, who from the start Jacobite hopes rested upon, was an attractive and boisterous child on whom his parents doted. He had ability in languages and was taught to speak English, Italian, French and Latin. Charles experienced warfare for the first time at the siege of Gaeta, only fourteen at the time, he was reported to have conducted himself bravely when under fire. His parents relationship had deteriorated over the years, his deeply religious mother spent long periods in unhealthy fasting and excessive devotions. Sadly, this undermined her health and Clementina died in 1735. The tangled matter of the Austrian Succession resulted in war being declared between Britain and France in 1744, which raised Jacobite hopes that they might now acquire much needed support from the French. Louis XV agreed that a diversionary Jacobite rebellion in England would be greatly advantageous to his own cause. Accordingly he assembled a fleet at Dunkirk, to where the young and enthusiastic Charles travelled incognito from Rome. Charles expedition set sail for England in March, 1744. They were met by a British fleet near Torbay, the Jacobite fleet was badly damaged and forced to return to France. 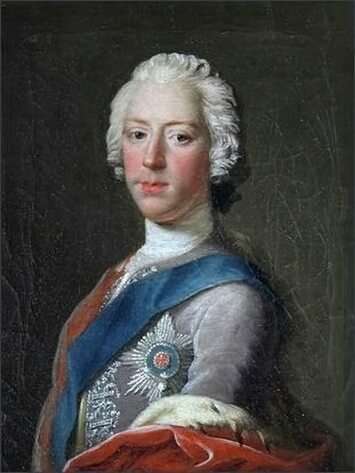 Charles, greatly disappointed but unbowed, harboured a steely determination that the only way to regain the Stuart thrones was to get to Scotland and raise a rebellion himself. Along with a small band of followers he borrowed enough money to buy munitions, and acquired three ships, the Elizabeth, the Du Teillay, and La Doutelle. When the impatient Charles' over optimistic expedition finally put to sea, the Elizabeth was attacked by an English man-of-war and had to return to France. La Doutelle was forced to flee. Charles continued alone in the Du Teillay and landed on the Hebridean Island of Eriskay. He sent messages to the local clan chiefs making them aware of his presence and asking for support. Alexander MacDonald informed him that their support would not be forthcoming and advised him to go home. Charles replied famously "Sir I am come home, and I will entertain no notion of returning to that place whence I came, for that I am persuaded that my faithful Highlanders will stand by me." The Du Teillay anchored the next morning at the remote sea loch of Loch nan Uamh. Further Highland chiefs came to see and admire the Prince, a handsome and dashing figure, but were similarly unenthusiastic of the chances of his expedition's success. Charles, characteristically refusing to accept defeat, persuaded some of them to join him in his rash venture, and solicited the support of the influential Cameron of Lochiel. 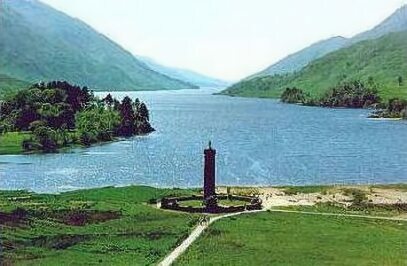 The standard of 'James III' was again raised in Scotland at Glenfinnan on Loch Shiel on 19th August, 1745. This was the appointed rendezvous point for those of the clansmen who had promised to join the rebellion. After a three hour wait, during which he must have been on the brink of despair, the clans began to descend from the surrounding hills to join their Prince. It must have been an evocative and moving sight as the tartan clad clans marched down from the hills to the rousing sound of the bagpipes. The Hanoverian government in London placed a price on the head of the Young Pretender. Charles responded in defiance by offering the same amount for the capture of "the Elector of Hanover". The Jacobite army entered Perth on 4th September, and was joined there by Lord George Murray, the brother of the Duke of Athol and an experienced soldier, whom Charles appointed Commander of his army. The army reached the outskirts of Edinburgh on the 16th September and delivered an ultimatum to a deputation from the city. A second deputation arrived requesting time to discuss the ultimatum, which Charles suspected to be merely creating delays. 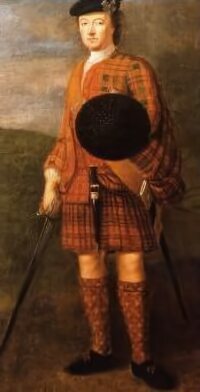 As the deputation returned through the city gates, Lochiel and Murray rushed in with 900 troops, they were not offered resistance and Charles rode proudly into Edinburgh dressed in the Stuart tartan to rousing cheers from the populace. The capital of Scotland was now his. Edinburgh Castle alone held out for the Hanoverians. Sir John Cope advanced with government forces to confront the Highland army. The Stuart Prince marched to meet him and the two armies faced each other at Preston pans on 21st September, 1745. Charles' army, lead by a local man who was familiar with the marshes which covered the area, made a daring approach on the enemy, under cover of darkness. When dawn broke, a thick damp Scottish mist obscured the entire area, clinging to the ground, it concealed the two armies from each other. Taking them entirely by surprise, the Highlanders charged Cope's unprepared army. The government forces and Cope himself panicked and fled, thus distinguishing himself by becoming the first general to bear the news of his own defeat. This victory unfortunately instilled in the over confident and naturally high spirited Charles the mistaken belief that his Highlanders were an invincible fighting force. The Prince held court at Edinburgh, taking up residence at Holyrood House, the Palace of his Stewart ancestors and wrote triumphantly of his victory to his father in Rome. He remained in Edinburgh for six weeks, flirting with the people of Edinburgh, the ladies especially, were much taken by the young Stuart Prince, who cut a dashing figure in his highland dress. On Charles' prompting, the decision was reached for the army to advance into England. The Jacobite strategy was to split their army into a two-pronged advance which re-met by the walls of Carlisle. The border town was placed under siege and capitulated to the Jacobites on 17th November. They continued to Preston, and despite appalling weather conditions, reached Manchester, where they gathered a small number of recruits, which formed the Manchester Regiment, but to their dismay, the English did not rush in large numbers to join his rash venture, as Charles had anticipated they would. On 5th December the Jacobites reached Derby, a few days march from London. Here matters began to go awry for Charles. His sources informed him that in back in Edinburgh, the Castle garrison had received reinforcements which had plundered the city, and that William, Duke of Cumberland, the vastly obese younger son of the Hanoverian King George II, was on the move to meet him with a force of around 10,000 troops. Unknown to the Jacobite commanders, in London, but 150 miles away, panic had gripped the city, the streets were empty and people rushed to withdraw their savings from the banks. It was rumoured that George II himself had packed his bags in preparation to leave for his native Hanover before the ranks of the wild and savage Highlanders descended on the city. At the resulting Council of War, Prince Charles argued passionately and at length in favour of proceeding with the march on London. Murray, of a more cautious frame of mind, was concerned about the vulnerability of their position and urgently counselled a return to Scotland. In the resultant vote, Charles, to his utter fury, was overuled. The army turned despondently back to Scotland, which had a detrimental effect on its morale, the strong-headed Charles himself took the decision with a bad grace and spent days sulking over it. Leaving a garrison at Carlisle Castle, later to be utterly annihilated, they reached Glasgow on Christmas Day, 1745. The government forces under General Hawley were met in battle on a moor to the south west of Falkirk on 17th January, 1746, where the Jacobites triumphed. The Prince then made his biggest blunder of the campaign, weeks were wasted in a fruitless and futile attempt to besiege Stirling Castle. Charles stubbornly ignored the advice of the more experienced Murray and most of his chiefs, to let the army rest and recuperate over the winter. On 16th April, Charles came to the fatal and foolish decision to lead his now ragged and exhausted army to meet Cumberland's highly disciplined and well provisioned forces at the fateful field of Culloden.